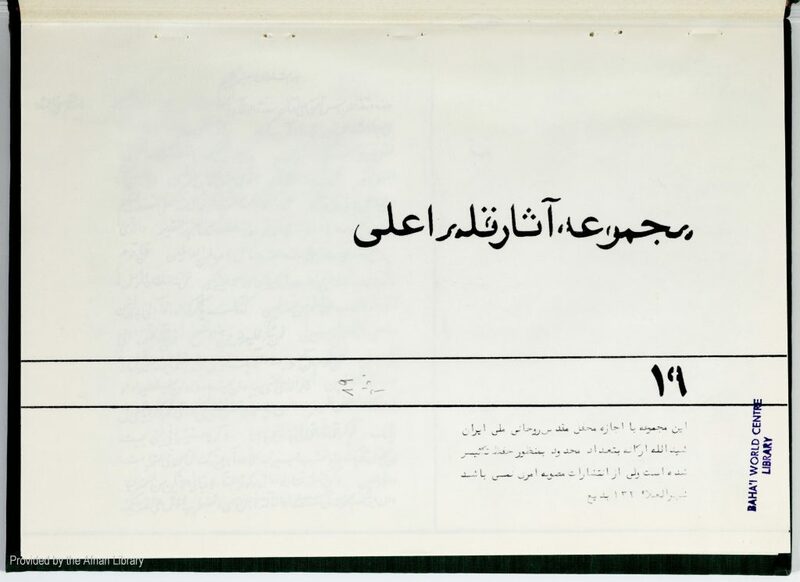 Description: Collection of Tablets of Bahá’u’lláh, including Arabic Tablet of Ahmad (p. 1). Most have the names of the recipient. Some have the place of residence indicated by a single letter. The Tablets are to individuals residing in various localities including Tabríz, Miyándu’áb and Zanján. Some of the early Tablets in this Collection have a marginal notation to indicate that the original Tablet was in the handwriting of `Abdu’l-Bahá. Some of the later Tablets are dated. Up to p. 399, the text of this volume is identical to INBA vol. 32. The handwriting is different, however. There is a detailed index of the contents, pp. 232-51 of PDF. Manuscript, 462 + 20 unnumbered pp. (252 pp. of PDF).